The front of our building faces Route 283. Our driveway approaching from the west. Next brick and mortar store hour change will be mid May, 2019. Our online store is open 24/7. 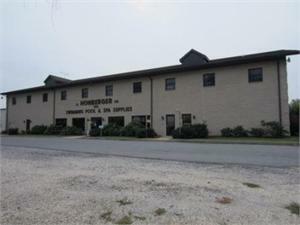 The J L Honberger Co., Inc. brick and mortar store is one of the largest in Pennsylvania. Our product line and inventory include after market equipment, supplies and chemicals for both commercial and residential swimming pools. We make it a priority to understand the parts needed for the equipment local pool installers are providing new and existing swimming pool owners. We carry bulk size chemicals for commercial and residential use. Our business philosophy has always been to educate our customers. We want you to understand the whys behind our recommendations. Our brick and mortar store is conveniently located along Route 283 between Mount Joy and Salunga in Rapho Township. 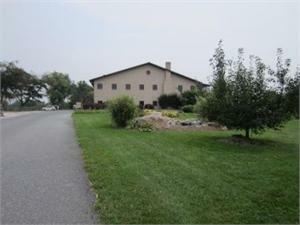 Address for your smartphone: 883 S. Chiques Rd., Manheim, PA 17545 (click on address link for map and directions). Easy access to our driveway from exits off of Route 283 (Salunga exit from Lancaster, turn left at stop sign, go 2/10 mile and turn right onto S. Chiques Rd. and our driveway / building is on the right after 8/10 mile. // Esbenshade Rd exit from Harrisburg, turn right at stop sign, go to traffic light at Route 230 and turn left, go 1/10 mile and turn right onto S Chiques Rd. and immediate left into our driveway). Easy access to our location (major roads without the traffic congestion). Easy access (no steps or curb) into our store. Easy access around our building to pick up points and/or unloading points. Educational classes for residential pool owners (new in 2019). Educational classes for spa owners (new in 2019). PA Department of Agriculture approved courses for commercial swimming pool operators (new course schedule to be released by June 1, 2018). From our counter to your car, we help load your purchases. We offer shopping carts, shopping baskets and platform carts for shopping convenience. Drop shipping capabilities. Although we carry a large inventory of parts, it is impossible to stock everything. And that is where our sources and resources play an important part in satisfying our customers. We'll check vendor inventories while you wait and get your order processed while you wait.